Explanation: The Fermi Science Playoffs celebrate 10 years of the Fermi Gamma-ray Space Telescope's exploration of the high-energy universe. Surviving all early rounds of voting, these two finalists in the competion square off at last. Digital illustrations from a list of 16 of Fermi's top scientific discoveries, they represent the competition's two top seeds, defeating 12th seed New Clues to Dark Matter and 14th seed Starquakes in Magnetar Storm in the semifinal round. On the left are unprecedented, unpredicted, 25,000 light-year tall Gamma-ray Bubbles above and below the plane of our Milky Way galaxy. On the right, violently merging Neutron Stars Collide to create the first gamma-ray detected gravitational wave event. Pick one now and cast your vote here to crown the most popular science result from Fermi's first decade. BOTH... a tie...but if forced to pick... "Neutron Stars Collide". It was a big question, and a long time coming. Being a firm believer in co-operation rather than competition, one has to pass here but best wishes all round. Stating the obvious I know but science, like music, isn't about competition. Are these actual telescopic images, false-colour enhancements, overlays of gamma images with visible light, or artists' impressions? The text doesn't make it clear. They are FAKE NEWS. I think this whole "competition" is disgusting. 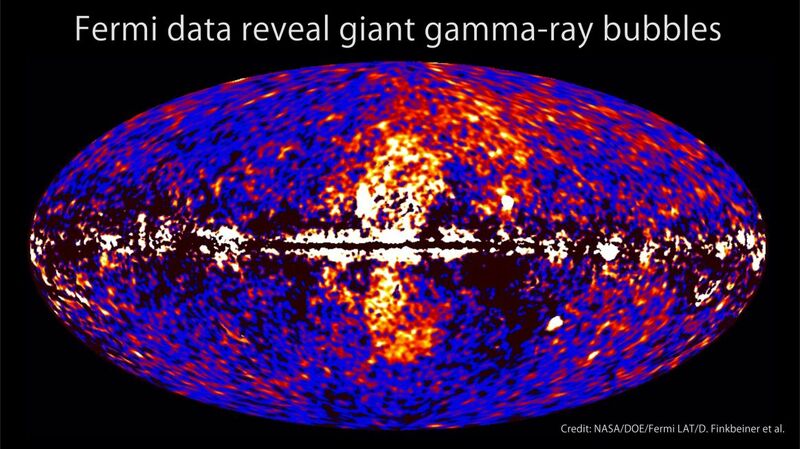 Giant gamma ray structures in the Milky Way. As for the colliding neutron stars, they are located some 130 million light years from the Earth, and they are very tiny. No Earthly telescope exists that could photograph the colliding neutron star merger in such detail as in today's APOD. Music competitions are valuable and advance music. Likewise for science competitions. Not only do they motivate musicians and scientists, but they also can be very valuable in stimulating public interest (which is the main point of this particular competition). I want to cast my vote for the version that Ann posted. On the right, violently merging Neutron Stars Collide to create the first gamma-ray detected gravitational wave event. due to the importance of this event in the history of astronomy. This was the first ever "multi-messenger event", leading to confirmation of important theories re heavy element formation. Most of those who cast their votes in this competition will vote like you did, Bruce. But of course, as a galaxy nerd, I had to vote for the Milky Way bubbles. Maybe not Ann. This is a close call I think, because only Fermi could make the Milky Way Bubbles discovery, whereas a great many space and land based observatories were part of the neutron star collision discovery. If Fermi had missed the NS collision the discovery would still have been made, just with somewhat less confirmation. What tipped the balance for me was the large difference in importance between the two discoveries.